Today’s the day the 2 marble blocks came together albeit briefly so I could draw the overall shape of the sculpture. This is trickier than it seems as the stones are still rough with little hope of drawing a straight line. The artisans use an inked string which they pull taught over the stone face and give it a twang leaving a black line which they can follow for cutting or as a grid line. Frustrated at not being able to communicate adequately with the artisans despite the best efforts of my friend and translator Zhong, I resorted to making a clay model which resembled the two blocks stacked one on top of the other. I proceeded to slice into the clay model in the manner and sequence I considered the best way to reveal the form of the sculpture. By this time a small group had gathered to witness the goings on. “That is OK in clay but we have stone to cut and that is not the way we usually do it. 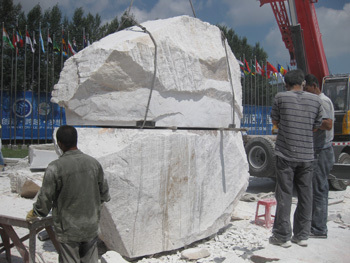 First we create the form of the stone, then we shape it. Just draw the outline of the form at this stage.” Even doing that simple task proved to be difficult as the artisans refused to let me scramble on top of the stone as they indicated it was unsafe for me; so one of the artisans clambered up instead and together we created the much sort after line on the stone. I am learning so much working with these people who also love working with stone; we just come at it from different angles. I engage with a new stone by working with it, chipping away, cutting drilling to assess the character of the material. I then ‘feel’ my way into the work exploring a variety of sculptural possibilities until one feels right and I see it through until all aspects of the sculptural work are resolved. 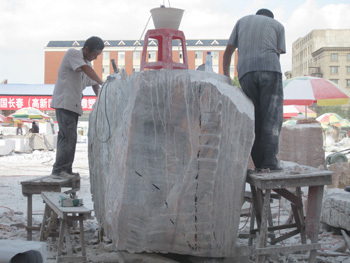 The artisans have a different agenda, to work the stone to achieve a specific result. The scale model I brought with me from Australia has been then most useful item in my kit bag. The blocks have again been separated and the cutting an hammering continues at ground level. 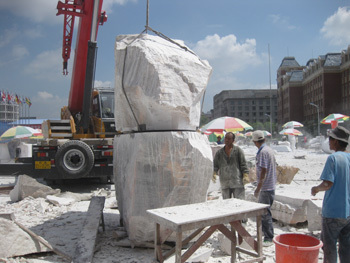 And the count-down has begun as the sculpture needs to be completed before the end of August.